The Twinkle Twinkle Little Star Lyrics were first written as a poem by Jane Taylor. The poem was originally published with the title "The Star" in Rhymes for the Nursery by Jane and her sister Ann Taylor in London in 1806. The lyrics are easy for young children to learn.This nursery rhyme in particular makes children more interested in the stars at night. When my grandson learned this rhyme when he was three, he immediately wanted to stay up late to see the stars and recite the poem. And then, he wanted to learn what stars are actually made of. Like the rhyme, he wondered what they are. I thought it might take the fun out of star gazing to learn they are really big balls of gas, most notably hydrogen and helium. But my grandson was simply fascinated. He's nearly seven now and still loves looking at the stars. Of course that may be that he can stay up a little later on weekends to see them. At the same time, he has learned some of the constellations and can point them out. Scroll down to find a coloring page to go with the rhyme. 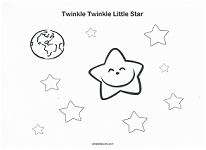 Try letting the kids color the star with glitter pens or use actual glitter so the star "twinkles".